Information you provide us when you purchase goods or services including your name, address and contact details. We use Google Analytics remarketing codes to log when users view specific pages or take specific actions on a website. This allows us to provide targeted advertising in the future. To establish and maintain your relationship as a client of Dwyer Property Investments. To provide the services you have requested from Dwyer Property Investments. To administer and manage those services. For emailing news about services you have shown interest in or new services. If we contact you in this way without obtaining your prior consent, we will provide you with the opportunity to decline any further marketing communications. 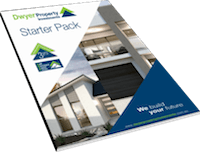 If you at any time receive any communication from Dwyer Property Investments that you would prefer not to receive, please contact us and we will remove your name from our mailing list. In most cases you can gain access to the personal information that Dwyer Property Investments holds about you, subject to some exceptions allowed by law. If you would like to check or amend your contact details, please contact us. We will deal with all requests for access to personal information as quickly as possible. Dwyer Property Investments will take reasonable steps to keep secure any personal information that we hold and to keep this information accurate and up to date. Personal information is stored in a secure server or secure files. However, the Internet is not always a secure method of transmitting information. Accordingly, we cannot accept responsibility for the security of information you send to, or receive from us over the Internet or for any unauthorised access or use of that information.